WaPo: As with "Bottle Rocket," it's hard to explain why this movie is so enjoyable. It starts with Schwartzman, whose bespectacled, tight-lipped, blazer-and-tie presence suggests a preppie preemie sprung fully dressed from the womb. As Max, he perfectly embodies the bizarre timbre of this movie. As Schwartzman's counterpoint, Murray is his wonderfully churlish self. 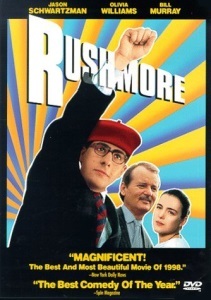 He walks through "Rushmore" as he does most of his films: slightly disgusted and bemused by everything, creating comedy with the mere tone of his voice, a roll of his eyes, or an emphasis in some unexpected part of the sentence. Rolling Stone: To call Rushmore a romantic triangle about clinical depressives doesn't allow for the film's bracing humanism. No tidy happy ending here. Just a cotillion honoring Max's Vietnam play and allowing the major characters to come together, change partners and dance to a Faces song, "Ooh La La," that links youth and experience in a lovely, fleeting moment of reconciliation before the shooting recommences. Anderson closes the curtain on his movie as if he were directing a play by Max Fischer, which, of course, is just what he has done. birthmoviesdeath: In fact the main emotional conflict in the film, Max dealing with the death of his mother, is only mentioned about a handful of times. But it’s the key to who Max is. He’s a busybody because he doesn’t want to spend time at home missing his mother. He’s dismissive of his father sometimes because that’s the only link he still has to her. He loves Rushmore because it was his mother’s idea he go there. Anderson never dwells on any of this, but instead allows Max’s actions to reflect these feelings. Slate: Anderson and his co-writer, Owen Wilson (who starred in the pair's last film, the tediously quirky 1996 BottleRocket), play a funny game with their indefatigable protagonist. On one hand, they let us know that Max is a screw-up and a hustler; on the other, they collude with him in myriad ways, to the point of warping their mise en scène to reflect his worldview and enhance his stature. It's this tension that leads some people to regard Rushmore as having dramatic complexity, but I think Anderson and Wilson are just trying to have it both ways. Like their hero, they spend a lot of time patting themselves on the back for being aggressively unconventional. Roger Ebert: Anderson and Wilson are good offbeat filmmakers. They fill the corners of their story with nice touches, like the details of Max's wildly overambitious stage production of "Serpico.'' But their film seems torn between conflicting possibilities: It's structured like a comedy, but there are undertones of darker themes, and I almost wish they'd allowed the plot to lead them into those shadows. The Max Fischer they give us is going to grow up into Benjamin Braddock. But there is an unrealized Max who would have become Charles Foster Kane. The film seems a bit precious to me now and I don't love it nearly as much as I used to, but the replica Rushmore Perfect Attendance and Punctuality Award pins I got on Etsy nearly 10 years ago are still some of my most treasured possessions. Still love Jason Schwartzman as much as I always did though. Probably always will. This movie is literally why I took Latin in college. Pro-tip: don’t choose your foreign language based on a movie. This movie has my favorite piece of Bill Murray acting, which is his silent reaction when Max introduces him to his father. I have to wear scrubs occasionally for my job, and when I come home in them my twelve-year old inevitably says "I like your nurse's uniform, guy". The two of us actually quote Wes Anderson films back and forth constantly, but I think Rushmore might be her favorite. She's in drama now, and when someone asked her if she has any experience, she said "I wrote a little one-act about Watergate". I died. We both have dead people in our families. "These are OR scrubs." "O R they?" This exchange from the commercial for the movie made my mom laugh so hard we actually went to see it.